The weather may have been cold, but in the Performing Arts Center, the air was warm and lively with fanfares and marches at this year’s Winterfest. The annual two-part concert took place in the auditorium Wednesday, Jan. 23 at 7 p.m. This year, the show consisted of the Bigelow and F.A. Day bands along with North’s Symphonic Band and Wind Ensemble. The Bigelow Symphonic Band, conducted by music teacher Amanda Trimpey, opened the concert with two upbeat and energetic pieces. The first one was “Kentucky 1800,” a melodic piece based on the tunes of traditional American Folk songs such as “The Promised Land” and “Cindy.” Paired with “Sousa Spectacular,” a lively march featuring the percussion, Bigelow set a charismatic precedent for the rest of the show. The Day 7th and 8th-grade band followed with another stunning performance. The first song, “Dorian Rhapsody,” featured a medieval theme and a clarinet solo. “The piece includes an energetic opening with a slower lyrical middle section and finishes with a thrilling conclusion,” said Day music teacher Aaron Rivkin. The second song, a jazz piece titled “Watermelon Man,” had the audience members nodding their heads along to the beat. “‘Dorian Rhapsody’ has a fast and exciting tempo while ‘Watermelon Man’ is a slower and calmer tempo,” said Rivkin. “I wanted to highlight these contrasting speeds in our performance.” With a velvety bassline and funky beats, the song was a highlight of the concert. Rivkin conducted the band. 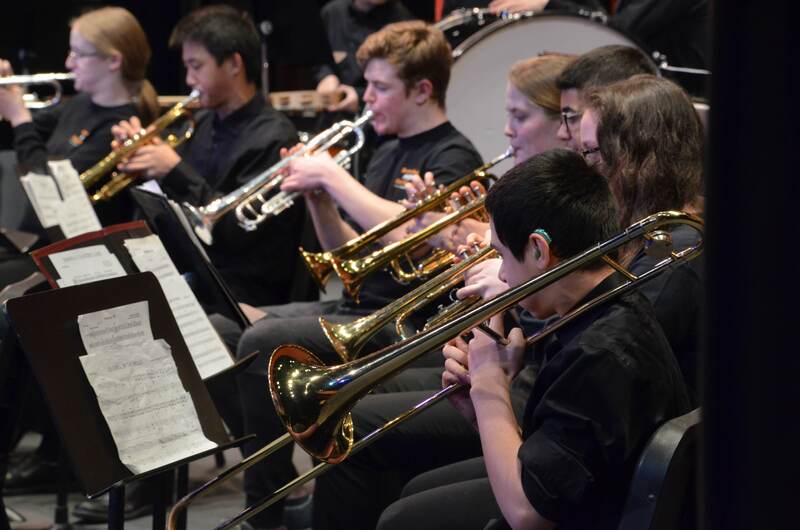 After the Day band’s performance, the Symphonic Band, which was conducted by music teacher Richard Labedz, came to the stage with a performance of “Blue Ridge Reel.” The song had notes of bluegrass with its jazzy flute solo. For their second song, the band played the classic ballad, “What a Wonderful World.” The notes of the wind instruments mingled with the smooth bass, giving the song a slow and nostalgic feel. “In the Mood” featured the jazz section. The catchy beat and tune had an old-timey feel and brought the audience back to the early 20th century with its swing instrumental. For the final part of the show, the Symphonic Band joined Wind Ensemble on the stage to deliver an energetic rendition of “Carol of the Bells.” The two bands’ combined sound reverberated throughout the auditorium as they gave a breathtaking performance of the classic Christmas carol. The chilling mood of the song fit perfectly with the cold of the winter. Members of Family Singers, North’s Honors Chorus, hold glossy blue books tightly in their hands. The books cover their faces, but the singers make sure they can see Adam Grossman’s sharp conducting motions. As Mr. Grossman lifts his hands to start the first song, the room seems to collectively take one giant breath in, awaiting the first note. Concert Choir and Vocal Ensemble watched Family Singers and orchestra from the audience. The girls in Family Singers wore elegant green dresses, and the boys wore suits. When Mr. Grossman raised his arms, the singers’ heads snapped into focus. They began the first piece in perfect unison, creating one powerful voice. Although the audience could not understand the Church Latin filling the auditorium, they watched intently. Family Singers, Vocal Ensemble, Concert Choir, and Orchestra performed at Winterfest II, Thursday, Jan. 24. All four ensembles performed “Hallelujah Chorus” by George Handel and “Glee” by Leonard Bernstein. The Family Singers and orchestra performed “Magnificat” by Antonio Vivaldi and “He Watching Over Israel” by Mendelssohn. “Magnificat” lasted 15 minutes as the group only performed certain songs within the piece. In past years, Winterfest had been a 45-minute song. Senior Sarah Rosenstrach, a second year Family Singer, said she liked the shorter length of the piece. “We get to do other pieces in the concert in addition to the mass, like the Mendelssohn piece and Bernstein piece,” she said. Eight soloists performed in “Magnificat.” A highlight of the concert was a duet between seniors Renée Dwyer and Laura Schwartz. The girls had strong, rich voices during their lines in the duet, but they also blended well together. The song contained many high notes, but both girls hit them effortlessly. The piece contained many songs that required the singers to hold long notes, but the singers managed to make their voices sound full with limited breath. After “Magnificat,” Concert Choir and Vocal Ensemble came to the stage. All the singers performed “Glee,” a quirky song that was drastically different “Magnificat.” Mr. Grossman had the groups perform it twice. Overall, the concert showed the hard work the choruses and orchestra put into their music classes.